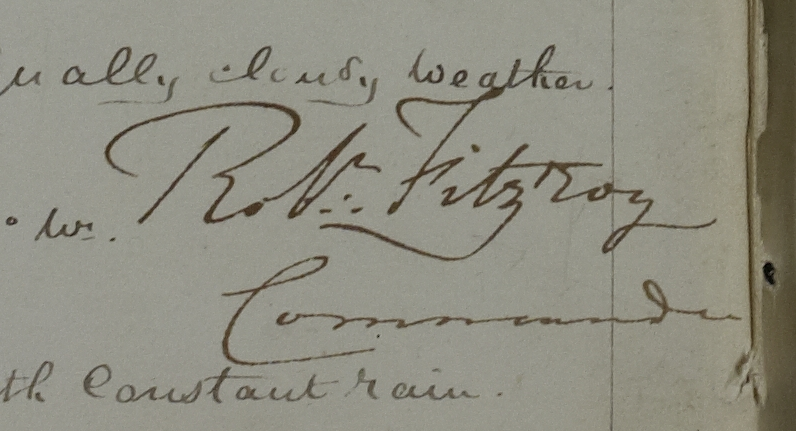 How to spell FitzRoy... or is it Fitzroy? Robert FitzRoy was the Captain of the Beagle that took Darwin around the world on one of the most famous voyages ever. 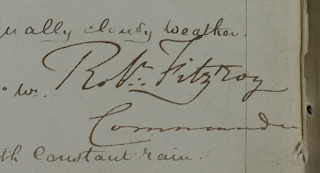 But beyond a famous ship captain, he later became the father of modern marine weather. He invented the concept of forecast, was a champion of the use of barometers, and was the first head of what is now called the UK Met Office. Which brings us to the point at hand. Note the unusual spelling of his name with a capital R. This is the most common way we see his name in print. But periodically one sees it without this embellishment of the capital R, so I often wondered what was right. Recently with occasion to browse through old logbooks–we all get our kicks in different ways–I ran across the answer to this question. Check out the bottom right of this logbook page from the Beagle. You will see his own signature in the style that he at least chose to use in signing his name. That is certainly an important data point in this esoteric study. 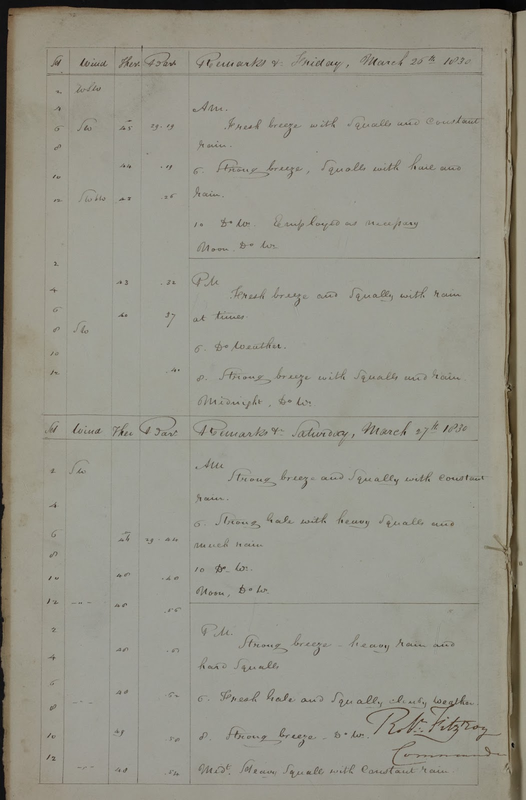 In 1830, time of this log entry on the Beagle, he was 25 years old, and had been Captain of the Beagle for barely 2 years. Maybe he changed his mind on this as he got more famous. The Darwin voyage started the following year, and ended sometime 1836. Love them now, or love them later. The value of digital publications for an offshore sailboat is pretty obvious. We can store a boat-sinking load of books on a thumb drive, available now with 128 GB storage for under $100––though it would be better to store them on something much bigger so we don’t lose it. A typical book is over a pound. Forty copies takes up a cubic foot. We can get this book with a few illustrations into 0.5 MB as an ebook, so our flash drive could hold 256,000 copies, which in round numbers corresponds to the size and weight of a house. It is prudent to have on board print copies of crucial navigation publications, but now there is no reason we do not have as well a complete mariner’s library of everything else we might need or care to have a look at when underway in the form of ebooks. An obvious category would be every manual for every piece of equipment on the boat, each fully searchable, with custom bookmarks and highlights, and even Internet and Skype or Viber phone links in them. Looking ahead, you could tap a link in one and have your sat phone call them. Add to that every Cruising Guide and Sailing Directions and related literature for where we are going, plus all of our work-related texts. But with all technology comes a learning curve. If everything we wanted were in free pdf files, that might be fine, and indeed many important texts for sailors are free pdfs, but many are not, and in fact, pdf is not always the best format. In the world of digital reading, pdf is probably on the way out. It does not have very good compression, and many pdfs are not efficiently made. The typical book as a pdf could be anywhere from 5 to 500 times the size quoted above, and the reading experience can vary dramatically. Portable document format (pdf) remains the dominant format for printing, with no change in sight, but that is not the topic at hand. The most popular ebook formats are Kindle, epub, pdf, and iBooks. Each has pros and cons, not the least of which is whether or not there is one for the book you want. We start with the easiest to buy and read, which accounts for why Amazon Kindle has more than 60% of the commercial ebook market––they have made an excellent product, with excellent distribution and support for both customers and publishers, not to mention that they mercilessly destroyed any budding competition with low prices. Indeed, when six top ebook publishers including Apple got together to defend themselves, the Department of Justice sued them for a price fixing conspiracy and won. Kindle was unscathed and left farther ahead. This is not to say it will stay this way. The technology and potential market are too important for one company to dominate for long. Google has made an effort at this for years, but has not got it together despite their resources. Kindle ebooks can be read on dedicated Kindle devices, now essentially mini-tablets with many wireless functions beyond book reading, including a Kindle App Store, or they can be read on free Kindle apps that run on any computer, Mac or PC, or any portable Apple (iOS) or Android device, phones and tablets. Kindle books can only be purchased at Amazon. All records of your book purchases are stored. You can move them from one device to another or view them on all of your devices. When you stop reading the book from your computer, and then open (say) the Kindle iPad app, the book will be open right where you left off, with all bookmarks, notes, and highlights updated. All of these records are saved automatically. On a bus ride, you can carry on reading from your phone. Then if you wish, you can loan the book to friends to read. (Loaning things is popular with cruising sailors.) Amazon has excellent online help to learn the features and options. They also have a gift program where you can buy a book for a friend and have the info sent by email to them, and if they do not want that one, they can convert your purchase price into a gift card for another book. Kindle apps will read Kindle file types (mobi, prc, azw, kf8) and they will also read pdf files. Kindle apps will not read epub files, which is actually the standard format for the industry. The file type epub is the format defined and standardized by the International Digital Publishing Forum (idpf.org). In essence all ebooks (not counting pdf) are in this format, but commercial companies, notably Amazon, Barnes and Noble, Adobe, and Apple, have chosen to use it, and then break it, so their protected books only work with their specific readers. Consequently, the supposed standard ebook format cannot be read in the most popular readers. Unprotected pdf files, on the other hand, can be read in any ebook reader or app, primarily because they are not commercial competition. A good generic ebook reader is called Calibre (calibre-ebook.com). It not only lets you read all unprotected ebooks in any format, you can also use it to create ebooks yourself in any format from about any kind of document, or convert one ebook format to another. It could be a good tool for making a consistent epub library from your set of manuals in various formats. If you care to create more complex ebooks have a look at Sigil, a popular open-source epub editor (code.google.com/p/sigil). The virtue of an epub format (protected or unprotected) over the pdf is it lets text flow and be resized to meet viewing needs. In fact, the virtue of pdf is its preservation of the original page design. An epub document made that way is called fixed format, but not all readers allow it. Copy protected epub and pdf ebooks are in large part controlled by the Adobe Content Server system of Digital Rights Management (DRM). These epub and pdf books can be purchased numerous places and read in the Adobe Digital Editions Reader (ADE) for Mac and PC, and in the Blue Fire Reader (among others) for iOS and Android devices. If a book is available in both epub and pdf, look at a sample of each to decide which meets your needs best. Like Kindle, your book purchases are recorded with Adobe or the company selling the books. You can view them on multiple devices, but Adobe does limit the number of authorizations allowed. A new and promising outlet for these products is bilbary.com (Luxembourg), which specializes in nonfiction titles. In principle it does not matter where you buy them once they are recorded into your account. Adobe, Amazon, and Blue Fire, for example, are all Seattle companies, though still the most active ebook companies in Paris. Apple has done with ebooks what they do in general. They adopt a technology, improve the packaging and user interface tremendously, then lock it down to their devices only. They offer an ebook development tool called iAuthor for free that would normally cost $1,000 but it only runs on Macs and it will only make ebooks that run on an iPad. The ebooks they make are in one sense the state of the art; they are gorgeous and they have every functionality you could dream of. On the other hand, they have a rather special market––besides being iPad only–– in that the files are huge. It is not uncommon for a tricked out iBook to be over 1GB per chapter. In contrast Kindle books have an absolute size limit of 50 MB. iBooks can be made smaller, and indeed you can open a normal (unprotected) epub or pdf in the iBooks Reader, but only in an iPhone or iPad. You cannot even run an iBook on a Mac, let alone a PC––however, this will be changing soon. Apple has announced that the next Mac OS to be called Mavericks will include an iBook reader. In many ways, iBooks has been largely out of the bigger (non-iPad) picture until this happens. Again, another giant of technology that is slowly opening up to ebooks; their eyes are still in large part set on schools using iPads. But the Apple position is not secure. Their impressive ebook format (epub3) is not at all a secret nor proprietary. Kindle’s kf8 format is one example, but authors, publishers, and reader software are just getting up to speed. This is, after all, an on going revolution in reading. One thing we have noticed is that the epubs that can be converted to iBooks via iTunes Producer (not the big ones done with iAuthor) do include more epub3 functionality already than the Kindle does. With the huge increase in Mac usage and the new Mavericks OS, we would anticipate the ongoing trend, noted below, of Kindle market share falling off and iBooks picking up. Nook books are limited to 20 MB, which is a handicap for complex books. We have found that we can make our most complex books fit into quite readable 50 MB (the Kindle limit), but cannot squeeze them more. On the other hand, they look even nicer in the ibooks format with larger file sizes. I will not dwell on this, but our own ebook system (elibrabooks.com) remains one of the best options for Windows OS, but it is not popular outside of our own use. It has served our students well for 15 years and continues to do so. It was one of the first copy protected ebook systems, and in terms of functionality, reading experience, and compression remains superior to others, but it only works on PCs running Windows. We have all of our books in this system, but we also have them in all of the other systems as well, which are much more popular for those not taking our online courses (www.starpath.com/ebooks). Price offers no guideline to ebook choices. An ebook could cost more than the printed equivalent or much less, and ebook prices change much more often than printed books. Companies can even give them away for a week as a promotion, or experiment with pricing to test sales. You can borrow ebooks from a library, even underway from an Internet cafe. Remember too that even though many readers love their Kindles and Nooks, with all the free apps available, you do not need a hardware reader for any of the ebooks except the ibooks from Apple (and that too is going to change), and even those can be read on an old iPhone or iTouch device. A list of online maritime publications is at www.starpath.com/navpubs. One value of ebooks when looking for a print book is to check out the ebook preview online. Amazon and Apple offer a quick peek into all ebooks (even a free sample ebook with notable content), even when there is no such look for the printed version. Remember, except for the ibooks, you do not need a dedicated reader, you can use your computer... and by Fall of 2013 you should be able to read iBooks on a Mac. For the time being, it is still a challenge for publishers to make epub ebooks from books with many sizes of pictures and tables, but this is changing steadily. New epub standards allow many options, and publishers and ebook Reader apps are beginning to catch up. At Starpath we are working on a new user interface for epub3 that should be a clean, consistent, and easy to use way to read technical ebooks with a lot of graphics, tables, and captions. Kindle claims they now sell 17% more ebooks than the sum of all printed books, hardback and paperback, and it is reported that 20% of US adults have read an ebook in 2012, but needless to say, there is the definite resistance among many readers to the use of ebooks. Many avid readers vehemently will not even give them a try. They like the feel of a “real book.” I have even heard a preference for the smell of a real book. And sure enough, we have books in our office from 1720 that still can be read quite clearly and are a joy to behold––if not to smell. I also have some 5.25” floppies and 10-MB zip drives in a drawer that once held all things digital we cared about, and they are now useless. But now in principle we have the clouds to store our digital content, including our ebooks, and chances are the clouds will be there as long as we are… and it will also be much easier to move the next time we have to. I had a huge resistance to giving up my slide rule, for about the same reasons we might cling to printed books. But there is so much to be gained from the ebook for reading, and the reading itself is so much easier. You do not need a light for reading in bed; you choose your font size and style; don’t know a word, just tap it for the dictionary; want to make a note just type it in; want a permanent bookmark, just tap the screen; want to find a specific reference, just search for the term; have 10 min to wait for someone, carry on with your book, which is in your pocket; traveling a long way, take several books with you without the weight; and it goes on. When you are reading Sinbad the Sailor to your kids from an iPad and they ask “Where is Persia?” you can tap Google Earth, show them, maybe fill in a bit about what has changed there, and then carry on with the story. 20 MB and must instead connect to Wi-Fi to download. Nook and Txtr (Germany) limit all books to < 20 MB, which rules out all Starpath textbooks, and any other highly illustrated or complex layouts. For those who want to follow the Apple v Amazon legal case, the outcome of which is about to be announced, here is a good back ground article: It's and Apple and Amazon World. The article refers to the application of what is called most favored nation in commerce.